The lynching of Augustus Goodman (? 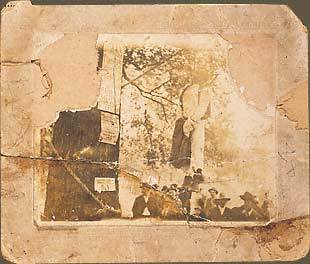 ), his body hanging from oak tree that served as a community bulletin board, onlookers. November 4, 1905, Bainbridge, Georgia. Cardmounted gelatin silver print. 5 x 4 1/4"
Pencil inscription on reverse: "Killed Jim Rush."